In an earlier post (http://lenfisherscience.com/98-necessary-mysteries/) I wrote about necessary mysteries – concepts and ideas that are beyond our direct experience, but which scientists have been forced to accept in order to make sense of that experience. Note that word “forced”, because it is key to the way that scientists think – a way that would greatly benefit politicians, economists, and indeed most of us in facing up to the problems of everyday life. The first is Carl Sagan’s injunction that extraordinary claims require extraordinary proof. This injunction goes back to the Scottish philosopher David Hume and his essay “Of miracles” (http://www.davidjamesbar.net/BTK/Belief,_Truth,_and_Knowledge_files/Hume,%20Of%20Miracles.pdf), but adherence to these logical principles is sadly missing in much public discussion, especially of pseudo-scientific claims by the woo-woo brigade. The second is philosopher Thomas Nagel’s wonderful little essay “What is it like to be a bat?” (http://organizations.utep.edu/portals/1475/nagel_bat.pdf). This should be required reading for every high school student (if you haven’t read it, DO), and addresses the questions of what consciousness means and how, if at all, we can make sense of our experience. As an added bonus, Nagel’s essay manages to touch on most of the major questions in philosophy; an incredible tour de force. The third is to avoid the trap of believing things just because they seem to make sense. I have offered many counter-examples throughout these little essays (e.g. http://lenfisherscience.com/15-the-uncommon-sense-of-science-2/), and pointed out that the history of science is often the history of nature defying common sense (this is why doing science is frustrating and fascinating in equal measure). It makes sense to many people, for example, that we should carry on in some form after our deaths, and to many people this means that ghosts must exist. 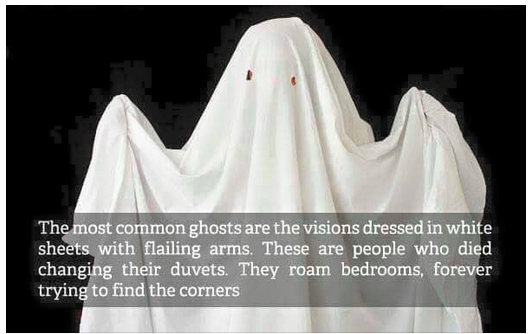 But ghosts are not a necessary mystery – those who believe in them only do so because they already believe something else with which a belief in ghosts fits. But ghosts, in terms of the known laws of physic, chemistry and biology, are an extraordinary claim, and their existence requires extraordinary proof. So far, none has been forthcoming.